HydraFacial MD is the latest advancement in non-laser, non-invasive skin resurfacing. HydraFacial treatment is based on a patented device which uses unique spiral design with vortex circulation to exfoliate, hydrate, and restore the skin. HydraFacial is not a facial! It uses a multi-treatment approach to correct problem skin and restore skin health! This patented, high tech machine combines cleansing, exfoliation, extractions, hydration, serum infusion, and antioxidant protection all into one treatment. The HydraFacial machine uses a series of different nozzles each with a unique spiral design and airtight suction to cleanse, exfoliate, extract debris and deliver antioxidants to the skin. How the HydraFacial treatment is performed. At Coundouriotis Facial Plastic Surgery and Laser Center, the HydraFacial treatment is the premier skin care treatment! It begins with Lymphatic Therapy to detoxify skin and optimize and lengthen treatment results. This is followed by four fundamental steps with each step requiring a different nozzle. Vortex Exfoliation: The skin is thoroughly cleaned and gently exfoliated using the patented tip to remove dead skin cells from the surface without irritation and discomfort. Vortex Peel: Using the innovative handpiece a combination of glycolic acid and salicylic acid are infused into the skin for a deeper chemical acid exfoliation to break down dead cell buildup without a harsh physical scrub. Vortex Extraction: The strong circulating liquid literally suctions out blackheads, sebum, whiteheads and other impurities that are clogging up the skin’s pores. Vortex Fusion: The HydraFacial’s unique spiral tipped handpiece infuses serums containing antioxidants, peptides, and hyaluronic acid into the skin. At this point the skin has been cleaned, exfoliated, well hydrated and ready to absorb appropriate nutrients. Depending on individual patient’s skin condition and needs, we also include LED Light Therapy combined with a wide array of clinically developed skin solutions and specialty treatment serums to address specific skin concerns. DermaBuilder Peptide Therapy helps to improve the appearance of fine lines and wrinkles, skin firmness, tone and texture. Growth Factor Infusion Therapy to help repair damaged cells and improve skin texture, elasticity and tone. LED Light Therapy: LED (Light Emitting Diode) Light Therapy is an anti-aging light treatment that works by emitting energy producing packets of light deep into the skin’s layers. We have both Red and Blue LED light therapy available with our HydraFacial system. Red Light Therapy stimulates cell growth and thereby increases the production of collagen and elastin. Red Light therapy also helps to improve the resilience and firmness of the skin. The blue light helps to diminish acne-causing bacteria and works synergistically with the HydraFacial treatment to reduce and improve acneic skin which is especially problematic in teenagers and young adults. Who is a good candidate for HydraFacial? The ideal candidate for HydraFacial is any man or woman who wants to quickly and easily improve the skin’s appearance. It is appropriate for all skin types and complexion shades including ethnic skin, thin or aging skin, dry or oily and sensitive skin. Patients see substantial results even with the first HydraFacial procedure: fine lines can be reduced; dark spots and uneven pigmentation is lightened; congested unsightly large pores are cleaned; and dull dry skin looks moisturized and healthy. 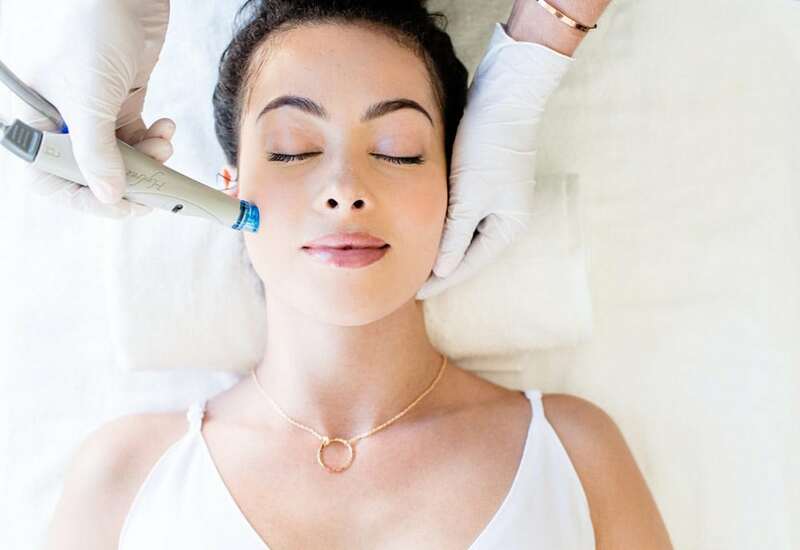 HydraFacial serums are designed to target certain skin problems, such as blackheads, whiteheads, brown spots, acne, sun damage, uneven skin tone, enlarged pores, and the fine lines of premature aging. However, HydraFacial isn’t just a temporary solution to brighter and more beautiful skin. It addresses the lymphatic system and improves the overall quality of skin, which makes it healthier in the long term. A HydraFacial treatment will leave your skin bright, attractive, and radiantly glowing for days! Initial results can last up to 5 to 7 days. 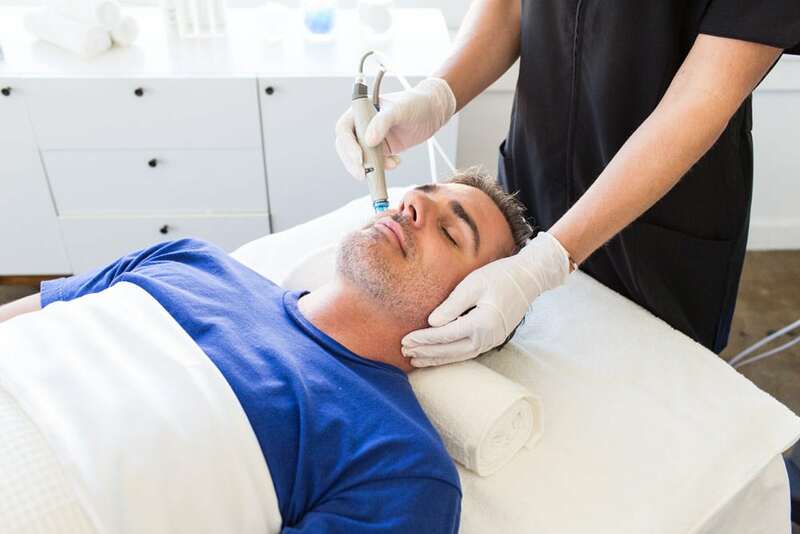 HydraFacial is a soothing yet powerful combination of skin treatments including: cleansing, hydradermabrasion, exfoliation, extraction, hydration, antioxidant protection, and corrective treatment. These simultaneous treatments leave more youthful, radiant, and healthy skin. How long does the treatment take? Is it painful? A HydraFacial is a fast, efficient treatment. The treatment can take as little as 45 minutes or as long as 90, depending on the condition of you skin and the problem area being addressed. It is soothing, non-invasive, non-irritating and there is no downtime. How often should I have a HydraFacial treatment? Depending on the condition of you skin and the specific issues being addressed, we recommend HydraFacial treatments every month to maintain results and skin health. We have special packages as well as membership programs to help you easily afford to keep your skin healthy and beautiful.